The Electric Machines and Power Electronics Laboratory is equipped with a Power Electronics Training System, which includes power MOSFETS, power thyristors, chopper/inverters control units, thyristors controllers, PID controllers, function generators, vector control drive converters, switch-mode power supplies. The lab also features oscilloscopes; electric machines, such as DC motors, synchronous motors and induction motors; a linear motor; dissectible machines; winding kits; and a data acquisition system. 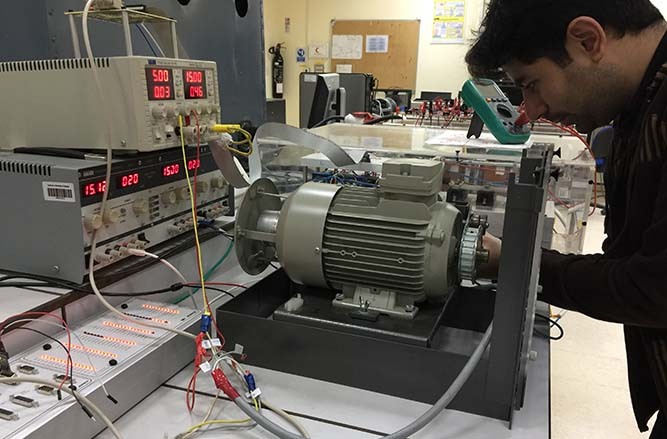 This lab is used for teaching the integration of power electronics converters and electric machines to design and implement motor drive systems. Tests for parameters identification of electric machines are also conducted here. It is also used for research in field-oriented control of AC machines and control of electromechanical systems. The lab is used primarily for teaching electrical machines, motor drives and power electronics energy conversion.